The Kingdom of Tungning (Chinese: 東寧王國; pinyin: Dōngníng Wángguó) or Kingdom of Formosa was a government that ruled part of southwestern Taiwan between 1661 and 1683. It was founded by Koxinga (Zheng Chenggong) as part of the loyalist movement to restore the Ming government in China after it was overthrown by the Manchu Qing dynasty. Koxinga hoped to recapture the Chinese mainland from the Manchus by using the island as a base of operations to settle and train his troops. The Kingdom of Tungning is sometimes known as the Zheng dynasty (Chinese: 鄭氏王朝; pinyin: Zhèngshì Wángcháo), Zheng Family Kingdom (鄭氏王國; Zhèngshì Wángguó) or Kingdom of Yanping (延平王國; Yánpíng Wángguó). 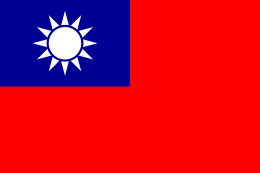 Taiwan was referred to by Koxinga as Tungtu (Chinese: 東都; pinyin: Dōngdū; Pe̍h-ōe-jī: Tang-to͘). In the West, it was known as the Kingdom of Taiwan, and the period of rule is sometimes referred to as the Koxinga dynasty. Following the defeat of the Ming dynasty, the Manchu Qing offered several high-ranking officials and military leaders of the Ming positions in the Qing court in exchange of cessation of resistance activities. Zheng Zhilong, a Ming admiral and father of Koxinga, accepted the Qing offer, but was later arrested and executed for not ceding control of his military forces to the Qing cause when asked to do so. After learning of this whilst pursuing studies overseas, Koxinga pledged to assume his father’s position and control of his remaining forces in order to re-establish Ming control of China. With most of China controlled by the Qing, Koxinga discovered the situational strategic advantages provided by a retreat and occupation of Taiwan from the translator Ho-Bin working for the Dutch East India Company. Supplied by Ho-Bin with maps of the island, Koxinga marshalled his forces estimated at 400 ships and 25,000 soldiers and seized the Pescadores (also known as Penghu Islands) so as to utilize them as a strategic staging point from which to invade Taiwan, at the time controlled by the Dutch. In 1661, Koxinga's fleet forced an entry to Lakjemuyse, and made landing around Fort Provintia. In less than a year, he captured Fort Provintia and besieged Fort Zeelandia; with no external help coming, Frederick Coyett, the Dutch governor negotiated a treaty, where the Dutch surrendered the fortress and left all the goods and property of the Dutch East India Company behind. In return, most Dutch officials, soldiers and civilians were allowed to leave with their personal belongings and supplies and return to Batavia (present-day Jakarta, Indonesia), ending the 38 years of Dutch colonial rule on Taiwan. 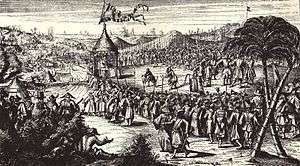 Koxinga did, however, detain some Dutch "women, children, and priests" as prisoners. He then proceeded on a tour of inspection with a contingent of nearly 100,000 soldiers to "see with his own eyes the extent and condition of his new domain." Realizing that developing his forces in Taiwan into a large enough threat to unseat the Qing would not be achieved in the short term, Koxinga began transforming Taiwan into a practically proper, albeit preferably temporary, seat of power for the southern Ming loyalist movement. Replacing the Dutch system of government previously used in Taiwan, Koxinga instituted a Ming-style administration, the first Chinese governance in Taiwan. This system of government was divided into six departments: civil service, revenue, rites, war, punishment, and public works. Great care was taken to symbolise support for the Ming legitimacy, an example being the use of the term guan instead of bu to name departments, since the latter is reserved for central government, whereas Taiwan was to be a regional office of the rightful Ming rule of China. Formosa (Taiwan) was also renamed by Koxinga as Tungtu, though this name was later changed by his son, Zheng Jing, to Tungning. The most immediate problem Koxinga faced after the successful invasion of Taiwan was a severe shortage of food. It is estimated that prior to Koxinga’s invasion the population of Taiwan was no greater than 100,000 people, yet the initial Zheng army with family and retainers that settled in Taiwan is estimated to be 30,000 at minimum. To address the food shortage, Koxinga instituted a tuntian policy in which soldiers served the dual role of farmer when not assigned active duty in a guard battalion. No effort was spared to ensure the successful implementation of this policy to develop Taiwan into a self-sufficient island, and a series of land and taxation policies were established to encourage the expansion and cultivation of fertile lands for increased food production capabilities. Lands held by the Dutch were immediately reclaimed and ownership distributed amongst Koxinga's trusted staff and relatives to be rented out to peasant farmers, whilst properly developing other farmlands in the south and the claiming, clearing, cultivating and of Aborigine lands to the east was also aggressively pursued. To further encourage expansion into new farmlands, a policy of varying taxation was implemented wherein fertile land newly claimed for the Zheng regime would be taxed at a much lower rate than those reclaimed from the Dutch, considered "official land". Following the death of Koxinga in 1662 due to malaria, his son Zheng Jing took over the Zheng regime, leading the remaining 7,000 Ming loyalist troops to Taiwan. Differing from Koxinga, it seems Jing attempted to reconcile peacefully with the Qing by travelling to Peking and bidding for Taiwan to become an autonomous state, but refusing to accept the conditions of compulsory Manchu hair style and regular tributes of currency and soldiers. In response to raids by Zheng Jing and in an effort to starve out the forces in Taiwan, the Qing decreed to relocate all of the southern coastal towns and ports that had been the targets of raids by the Zheng fleet and thus provided supplies for the resistance. This to a large extent backfired and from 1662-4 six major waves of immigration occurred from these areas to Taiwan due to the severe hardships incurred from this relocation policy. In a move to take advantage of this Qing misstep, Zheng Jing promoted immigration to Taiwan by promising the opportunity for free eastern land cultivation and ownership for peasants in exchange for compulsory military service by all males in case the island should need to be defended against Qing invaders. About 1,000 previous Ming government officials moved to Taiwan fleeing Qing persecution. Zheng Jing also recruited his early tutor, Chen Yong-hua, and passed to him most official government affairs. This saw the establishment of many important developmental policies for Taiwan in education, agriculture, trade, industry and finance, in addition to a tax system almost as harsh as that of the Dutch colonials. Taiwan soon saw the establishment of Chinese language schools for both the Chinese and indigenous populations and a concerted effort to break Dutch and Indigenous religious, language, and other cultural influences, and promotion of Chinese socio-cultural hegemony along with further expansion of towns and farmland into the south and east. This was realised in the eventual closure of all European and therefore Christian schools and churches in Taiwan, the opening of Confucian temples and the institution of the Confucian civil service exams to coincide with the implemented Confucian education system. Chen Yong-hua is credited for the introduction of new agricultural techniques, such as water-storage for annual dry periods and the deliberate cultivation of sugar cane as a cash crop for trade with the Europeans, in addition to the cooperative unit machinery for mass refining of sugar. The island became more economically self-sufficient with Chen's introduction of mass salt drying by evaporation, creating much higher quality salt than by rock deposits which were found to be very rare in Taiwan. The Dutch had previously maintained a monopoly of trade of certain goods with the Aboriginal tribes across Taiwan, and this monopoly of trade was not only maintained under the Zheng regime, but was actively turned into a quota-tribute system of exploitation of the native tribes to aid in international trade. Trade with the British occurred from 1670 through until the end of the Zheng regime, though for the most part limited because of the Zheng monopoly on sugar cane and deer hide, as well as the inability of the British to match the price of East Asian goods for resale. Throughout its existence, Tungning was subject to the Qing sea ban (haijin), limiting its trade with mainland China to smugglers. Aside from the British, Zheng major trade occurred with the Japanese and Dutch, though evidence of trade with many Asian countries exists. Following the death of Zheng Jing in 1681, the lack of an official heir meant rule of Taiwan would pass to his illegitimate son. This caused great division in the government and military powers, resulting in an exceptionally destructive struggle for succession. Seizing the advantage presented by the infighting, the Qing dispatched their navy with Shi Lang at the head, destroying the Zheng fleet at the Penghu Islands. 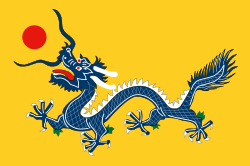 In 1683, after the Battle of Penghu, Qing troops landed in Taiwan, Zheng Keshuang gave in to the Qing Dynasty's demand of surrender, and his kingdom was incorporated into the Qing Empire as part of Fujian province, ending two decades of rule by the Zheng family. Several Ming dynasty Princes accompanied Koxinga to Taiwan including the Prince of Ningjing Zhu Shugui and Prince Zhu Hónghuán, son of Zhu Yihai. The Qing sent the 17 Ming princes still living on Taiwan back to mainland China where they spent the rest of their lives. 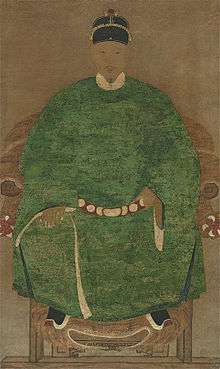 Zheng Keshuang was rewarded by the Qing Emperor with the title "Duke of Haicheng" (海澄公) and he and his soldiers were inducted into the Eight Banners. Troops who specialized at fighting with rattan shields and swords (Tengpaiying) 藤牌营 were recommended to the Kangxi Emperor. Kangxi was impressed by a demonstration of their techniques and ordered 500 of them to reinforce the siege of Albazin against the Russians, under Ho Yu, a former Koxinga follower, and Lin Hsing-chu, a former General of Wu. Attacking from the water using only the rattan shields and swords, these troops cut down Russian forces traveling by rafts on the river, without suffering a single casualty. Queen Tang, who had no son, was king Zheng Jing's seishitsu. ↑ Kerr, George H. (11 April 1945). "Formosa: Island Frontier". Far Eastern Survey. 14 (7): 81. doi:10.2307/3023088. 1 2 3 4 5 6 7 Lin, A.; Keating, J. (2008). Island in the Stream : A Quick Case Study of Taiwan's Complex History (4th ed.). Taipei: SMC Pub. ISBN 9789576387050. ↑ Andrade, Tonio (2005). "Chapter 11: The Fall of Dutch Taiwan". How Taiwan Became Chinese: Dutch, Spanish, and Han Colonization in the Seventeenth Century. Columbia University Press. ↑ Davidson (1903), p. 49. ↑ Davidson (1903), p. 50. 1 2 3 4 5 6 7 8 Wills, John E., Jr. (2006). "The Seventeenth-century Transformation: Taiwan under the Dutch and the Cheng Regime". In Rubinstein, Murray A. Taiwan: A New History. M.E. Sharpe. pp. 84–106. ISBN 9780765614957. ↑ Lin & Keating (2008), p. 13. ↑ Copper, John F. (2000). Historical Dictionary of Taiwan (Republic of China) (2nd ed.). Lanham, Md. : Scarecrow Press. p. 10. ISBN 9780810836655. OL 39088M. ↑ Jonathan Manthorpe (15 December 2008). Forbidden Nation: A History of Taiwan. St. Martin's Press. pp. 108–. ISBN 978-0-230-61424-6. ↑ Jonathan D. Spence (1991). The Search for Modern China. Norton. p. 56. ISBN 978-0-393-30780-1. ↑ R. G. Grant (2005). Battle: A Visual Journey Through 5,000 Years of Combat. DK Pub. p. 179. ISBN 978-0-7566-1360-0. ↑ Louise Lux (1998). The Unsullied Dynasty & the Kʻang-hsi Emperor. Mark One Printing. p. 270. ↑ Mark Mancall (1971). Russia and China: their diplomatic relations to 1728. Harvard University Press. p. 338. Davidson, James W. (1903). "Chapter IV: The Kingdom of Koxinga: 1662-1683". The Island of Formosa, Past and Present : history, people, resources, and commercial prospects : tea, camphor, sugar, gold, coal, sulphur, economical plants, and other productions. London and New York: Macmillan. OCLC 1887893. OL 6931635M.